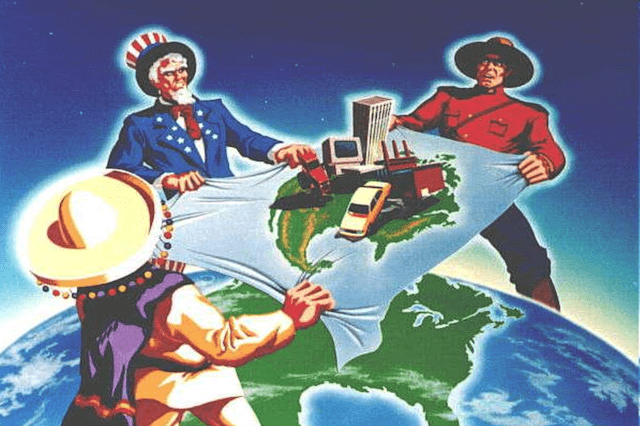 The NAFTA, or the North American Free Trade Agreement, went into effect on January 1, 1994. Tomorrow marks twenty since the major trade accord’s implementation Sine that time, some assert that Mexico has emerged as the country that has benefitted from it the most. Prior to 1994, Mexico’s economy would aptly have been characterized as being “insular.” Over the last twenty years, however, the country has steadily adopted policies that are foreign investment friendly, as well as has positioned itself as a global export platform through the concretization of NAFTA-like free trade agreements that govern commercial relations with upwards of forty nations. Mexico’s once sluggish economy exports one billion dollars worth of goods today. This represents tenfold increase over the pre-NAFTA figure. In terms of economic output, today Mexico’s economy is similar in size to that of Canada. Globally, Mexico ranks thirteenth gross domestic product, or GDP, rankings. Jaime Serra Puche, who was the Mexican economics minister at the time the signing of the NAFTA, is of the opinion that, if the Mexican reforms completed this year in the areas of education, energy, labor and taxes had taken place tweny years ago, Mexico gains would have been even greater than those evidenced thus far. Some of the biggest NAFTA related advances have been in the area of Mexican manufacturing, with the automotive industry, in particular, standing out. Today, Mexico has surpassed Canada in autombile manufacturing. The country accounts for twenty percent of all North American production, while Canada ranks third amongst the parties to the NAFTA with sixteen percent of the total. Most agree, however, that the NAFTA has played a significant role in creating a middle-class in which fifty percent of the country’s poplulation considers itself a part. Read the primary source for this post at Canadian Manufacturing.